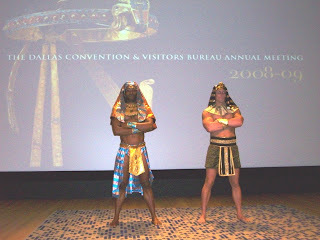 Today, I was fortunate enough to attend the King Tut exhibit at the Dallas Museum of Art as a guest of the Dallas Convention and Visitors Bureau. I can't say enough about how incredibly fantastic this exhibit was. But, let me regress for a moment and tell you how I got there. The Dallas CVB invited me and about 200 others to attend their annual meeting. In the photo above, you will see our "escorts" into the exhibit after the meeting. You have to be pretty secure in your manhood to wear that outfit all day. I'm just sayin'. Tutankhamun was one of the last kings of Egypt’s 18th Dynasty and ruled during a crucial, turmoil-filled period of Egyptian history.The boy king died under mysterious circumstances around age 18 or 19, in the ninth year of his reign (1323 B.C.). 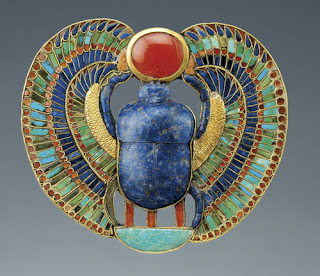 The exhibit was superbly divine - the artifacts are just magnificent. 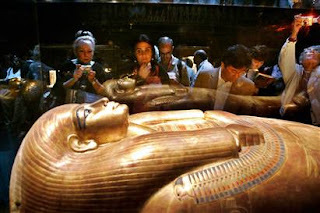 They had jewelry, sculptures and statues of all sizes, weapons, furniture. You name it, it was there. The detail and intricacy of the design work in these pieces is mind-boggling, when you consider that they were created like four thousand years ago! One of my favorite pieces was a child's sized chair that had been made for a princess of the time. It was a wooden chair with gold-leaf overlay on it. Beautiful design. But what made it so cool was that it still had the original woven thatched seat. let me repeat that - the original woven thatched seat. From four thousand years ago. And it looked like they just pulled it out of Grandma's attic and it was fifty years old. That's how good of shape it was in. Just unbelievable. 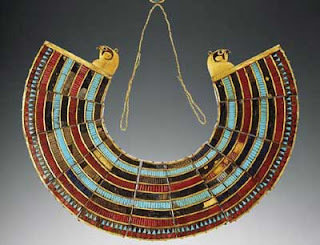 My other favorite piece was a gold box (see above for a small sampling of it) made for King Tut's wife. 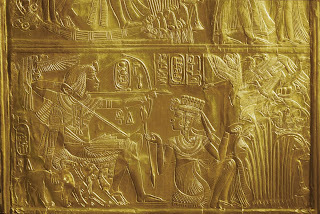 All around the box, were images of the two of them carved into the gold inlay depicting scenes of their life together. The artistry is just to die for. mere words cannot do it justice. So divine. The curator told us that nothing had been restored. Just cleaned. And when you see these magnificent pieces, you will be blown away. Buy your tickets now people. It's so worth it! !